Get your Ngong Ping 360 tickets at the best price and enjoy access to the designated Klook lane! The experience itself was great, with wonderful views! Definitely something to add to the agenda of visiting, or live here! Definitely worth it! One note of caution... you can't use the voucher itself to board; you have to queue and exchange it for a physical ticket. The queues at Tung Chung terminal were quite long & disorganised. Would be great if there were kiosks to scan & print ticket or if the scanners to get to the cable car were upgraded to scan the voucher & but just a bar code. 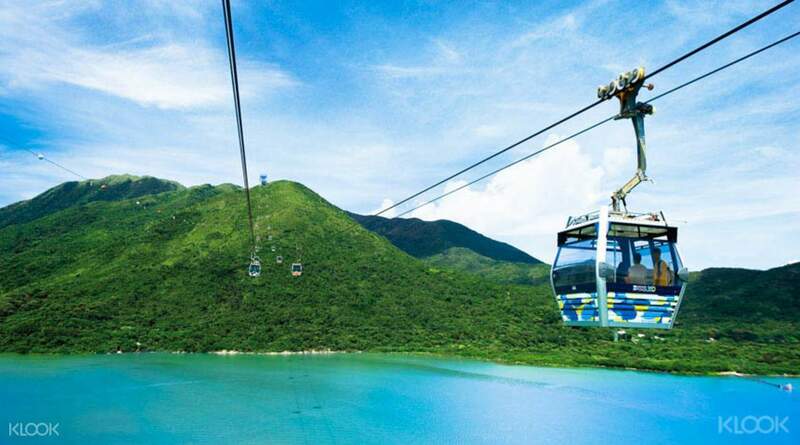 The Ngong Ping 360 Cable Car ride in Hong Kong is a visually spectacular 5.7km journey between Tung Chung Town Centre and Ngong Ping Village on Lantau Island. Watch as vistas of the South China Sea and rolling grassland slopes of North Lantau Country Park slowly take over from the buzz of Hong Kong city. Take in the serene and natural surrounds for which Lantau is famed, and look out as the Tian Tan Buddha (Big Buddha) rolls into the 360-degree view of the Ngong Ping Plateau. You can also claim your one way or round trip Ngong Ping 360 tickets when you present your voucher at the designated Klook lane! 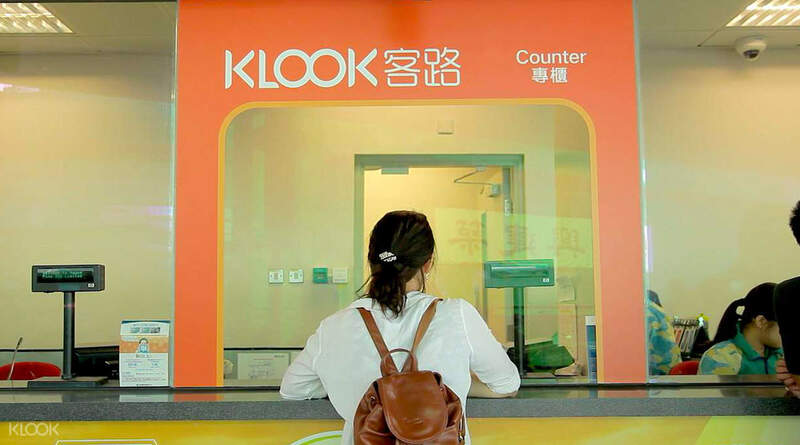 Easily redeem your tickets at the designated Klook counter by booking on Klook! Is Ngong Ping 360 worth it? People who've waited in long lines definitely prove that it is a must-try! Super excited experience travel in Hong Kong. Is a MUST itinerary when you travel to Hong Kong. Super nice view when travel inside cable car, it covered airport, Tung Chung, Dai Yu San, highly recommend and must TRY. Super excited experience travel in Hong Kong. Is a MUST itinerary when you travel to Hong Kong. Super nice view when travel inside cable car, it covered airport, Tung Chung, Dai Yu San, highly recommend and must TRY. This made our redemption for the cable car tickets very easy with the separate klook designated lane and redemption booth. If you are going to Ngong Ping Village during a very high tourist season, this is definitely a must because the line will reach almost near the City Gate Outlet. We were lucky that the Klook line was just half that line and was way faster. Thanks Klook!! This made our redemption for the cable car tickets very easy with the separate klook designated lane and redemption booth. 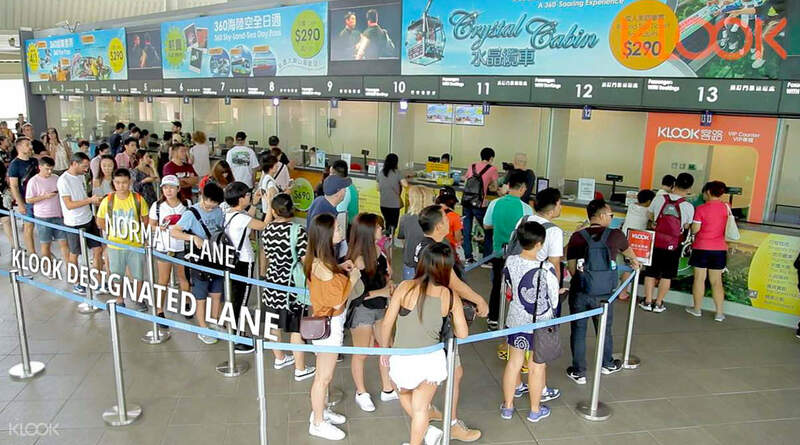 If you are going to Ngong Ping Village during a very high tourist season, this is definitely a must because the line will reach almost near the City Gate Outlet. We were lucky that the Klook line was just half that line and was way faster. Thanks Klook!! The whole family super enjoyed this attraction. There's long queue already even before the opening especially the lines without tix but we're able to redeem our tickets with shorter designated klook counter.. We manage to enjoy our time there because its a bit gloomy, windy and not sunny. Many picture perfect spots. Thank you klook! The whole family super enjoyed this attraction. There's long queue already even before the opening especially the lines without tix but we're able to redeem our tickets with shorter designated klook counter.. We manage to enjoy our time there because its a bit gloomy, windy and not sunny. Many picture perfect spots. Thank you klook! Buying on Klook is the best idea. The line is much shorter than the one where you buy on site. Best thing if you can make yourself get up early in the morning and go then, there would be less people. Looks like it really fills up after 11am. The view was amazing and beautiful. Don't need the glass floor in my opinion because you're looking around you and not down. Food is a bit pricy as expected with any tourist spot. I opted to get a drink and a small bite to eat near the temple. Only vegetarian so if you want meat you may have to wait til you leave. They don't allow meat or alcohol to be consumed near the temple. However, if you eat at the village before you get to the temple, there is a subway and pizzeria etc. All in all, pack a hat, sunscreen, mosquito repellent, sanitizer, tissues and umbrella. You can't go wrong. Oh and most importantly comfy shoes cuz you'll be doing a heck of a lot of walking. Enjoy! Buying on Klook is the best idea. The line is much shorter than the one where you buy on site. Best thing if you can make yourself get up early in the morning and go then, there would be less people. Looks like it really fills up after 11am. The view was amazing and beautiful. Don't need the glass floor in my opinion because you're looking around you and not down. Food is a bit pricy as expected with any tourist spot. I opted to get a drink and a small bite to eat near the temple. Only vegetarian so if you want meat you may have to wait til you leave. They don't allow meat or alcohol to be consumed near the temple. However, if you eat at the village before you get to the temple, there is a subway and pizzeria etc. All in all, pack a hat, sunscreen, mosquito repellent, sanitizer, tissues and umbrella. You can't go wrong. Oh and most importantly comfy shoes cuz you'll be doing a heck of a lot of walking. Enjoy! 5-Star, one of a kind experience in one of the longest if not the longest Cable Car in the world. It was the perfect date and romantic experience with my partner. It's as if you're flying over clouds and mountains, seas and rivers. 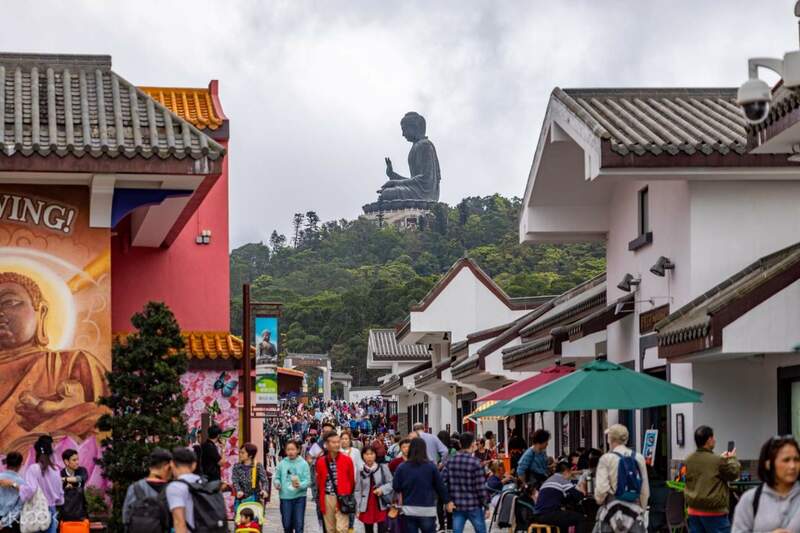 Enjoy mystical views atop the mountain in a traditional village with restaurants, cafes, and a giant Buddha before riding the cabin down to Tung Chung Station. Affords great views of Hong Kong International Airport for avi geeks too! 5-Star, one of a kind experience in one of the longest if not the longest Cable Car in the world. It was the perfect date and romantic experience with my partner. It's as if you're flying over clouds and mountains, seas and rivers. 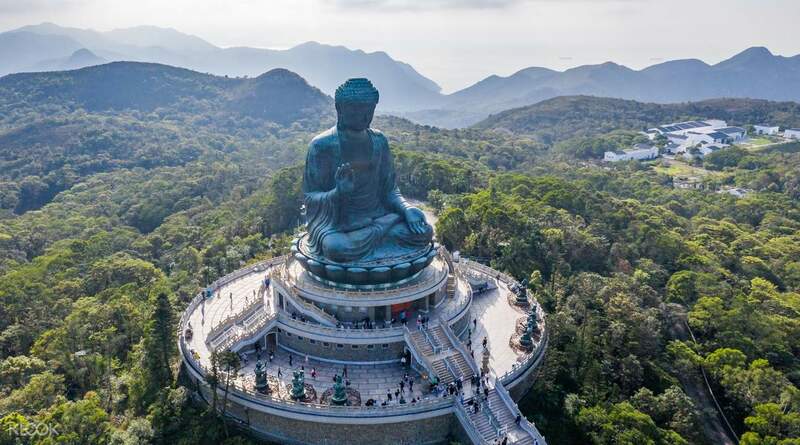 Enjoy mystical views atop the mountain in a traditional village with restaurants, cafes, and a giant Buddha before riding the cabin down to Tung Chung Station. Affords great views of Hong Kong International Airport for avi geeks too! Fast and easy redemption. There is a separate lane if you booked using Klook. We went on a weekday and didn’t even have to queue. It was foggy and a bit chilly with intermittent rain when we arrived in Ngong Ping, but we enjoyed the trip just the same. This is my fourth time to visit. Highly recommended. Fast and easy redemption. There is a separate lane if you booked using Klook. We went on a weekday and didn’t even have to queue. It was foggy and a bit chilly with intermittent rain when we arrived in Ngong Ping, but we enjoyed the trip just the same. This is my fourth time to visit. Highly recommended. One of the best place to visit in Hong Kong especially in Ngong Ping Village and very accessible via MTR. Glad we bought tickets through Klook last Travel Fest Blossom Deals for the price of Php 600 only (one way). Just wow! Thank you so much, Klook! More promos to come. One of the best place to visit in Hong Kong especially in Ngong Ping Village and very accessible via MTR. Glad we bought tickets through Klook last Travel Fest Blossom Deals for the price of Php 600 only (one way). Just wow! Thank you so much, Klook! More promos to come. It was so much fun. The place is so beautiful and so amazing. It was good to see different people with different nationalities in that place. People are waving at you when cabin two cabins from and going to the village meet. Eventhough there's a very long queue, Klook maintained and keep everything organized. I love klook, i've been using this app everytime i travel with my families and friends for almost two years now. It was so much fun. The place is so beautiful and so amazing. It was good to see different people with different nationalities in that place. People are waving at you when cabin two cabins from and going to the village meet. Eventhough there's a very long queue, Klook maintained and keep everything organized. I love klook, i've been using this app everytime i travel with my families and friends for almost two years now. Two thumbs up! Easy redemption of tickets just by presenting your phone app with the qr code. Despite the long queue, it took less than five minutes to get inside a cabin. Man! The view was breathtaking. The whole journey of about 25 minutes was worth it. It was so nice- warm sunlight and cool breeze... a must-try for those who want to experience height less the speed of a roller coaster. Two thumbs up! Easy redemption of tickets just by presenting your phone app with the qr code. Despite the long queue, it took less than five minutes to get inside a cabin. Man! The view was breathtaking. The whole journey of about 25 minutes was worth it. It was so nice- warm sunlight and cool breeze... a must-try for those who want to experience height less the speed of a roller coaster. A: No. You can use the Ngong Ping cable car tickets on any day before the expiration date indicated on the voucher. A: Yes. You can display the e-voucher on a mobile device at the counter to redeem the tickets.